Is Gluten An Enhancer To Cancer? Just as I was wrapping up a new post on my blog my attention was diverted to a TV add looking for donations as several young children spoke about their type of cancer. What a heart-wrenching appeal. You want to give everything you have so these children (and your own) won’t have to suffer the consequences of cancer and chemotherapy. It makes me crazy when I learn of very serious disease, especially in children, because I’ve read way too much about the hazards of gluten. Yes, many cancers are linked to celiac disease and gluten consumption by significant research in my book. 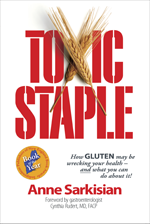 Quoted from Chapter 13 in Toxic Staple: Gluten Indicted: An Enhancer to Cancer “…gluten plays a role in the cancer equation, and for those who are gluten-sensitive, this connection can be significant: ‘Untreated celiac disease increases the risk of cancer 200–300%.’(1) A wide range of cancers, including non-Hodgkin’s lymphoma, throat/esophageal, stomach/intestinal/colon, and others are now being connected to gluten consumption. In addition, liver and throat ailments that can turn into cancer can clear up or improve on a gluten-free diet (GFD).” Many other cancers are mentioned and some studies are with children. A 2013 study concludes, “in any patient with celiac disease, having hematological [blood] complaints… a possibility of lymphoma should be kept. Bone marrow examination should form a part of work up, as some of these patients may be harboring more sinister leukemias.”(2) Acute myeloid leukemia and osteosarcoma, blood and bone marrow cancers, were mentioned by the children in the appeal. I searched one site that talked about healthy foods to help fight cancer. But if you have celiac disease, a malabsorption issue, your villi that absorb vitamins and minerals are being damaged. Lack of nutrition can affect any part of your body, even your blood and bones, and can lead to a weakened immune system, very likely setting one up for cancer and certainly making it difficult to fight it off. Is gluten the bottom-line in many cancers? One of the phrases I repeatedly ran across in my research for Toxic Staple was, “If you want to avoid the complications of celiac disease and lymphoma, you need to do the gluten-free diet 100%.” But so much more research is needed on the ramifications of cancer and gluten. Then this vital info needs to be made available to our doctors. I firmly believe most cancers could be prevented if one detected intolerance to gluten or celiac disease and then addressed a 100% gluten-free lifestyle. You will understand this by the time you get through the many GF success stories and supporting research in the book. Please share this blog with anyone dealing with cancer or any chronic symptom or disease.